Dr. Andres’ was born and raised in the island of Puerto Rico. As a high school student, he dreamed of becoming many things, including a medical doctor. He was told by teachers that he wouldn’t make it because he didn’t have the capacity to do so, and they were right. Not because he didn’t have the capacity, but because God wanted something better for him. He choose another path and ended up receiving his Doctor of chiropractic degree from Life University in 2016. All of his life he was a shy kid that sat in the last row of classrooms so he wouldn’t be noticed. Speaking in front of and meeting new people was a nightmare. After finding his passion in chiropractic, he thought that if he didn’t share his message of hope and healing many people would suffer unnecessarily. Now he loves to speak in public about health, wellness, and chiropractic in general. He speaks to audiences of all ages, in spanish or in english. His philosophy has always been to leave his corner in the world a little bit better than how he found it. He does it by helping people understand that their bodies were made to be healthy and that the human body was created in perfection. As a doctor of chiropractic he has been able to help hundreds of people that unfortunately lost hope and thought they didn’t have any options left. 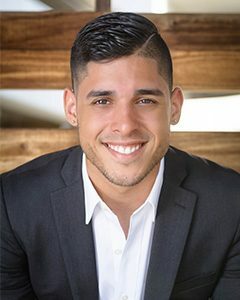 After hurricane Maria hit the island of Puerto Rico he decided to move to Loveland, Colorado with his girlfriend and future wife Génesis Reyes, and became one of the doctors at Elevate Chiropractic. It’s has been a big change but while he is new to Elevate Chiropractic he is not new to chiropractic. He is looking forward to serving the Northern Colorado community as well as the latino population in the area. He’s been a guest speaker at different seminars across the chiropractic profession. He has been to several mission trips to Haiti to bless the community with neurological based chiropractic care. He has been a guest at TV shows, radio programs, and wellness podcasts. All of this accomplishments are just the tip of the iceberg compared to the impact he wants to bring to the Northern Colorado area. He brings to the office the warmth and joy that the latino culture is known for, the professionalism that is expected from a health professional, the compassion that is needed for caring for people, the charisma that young people have, and the knowledge needed to better serve the community up in Northern Colorado.